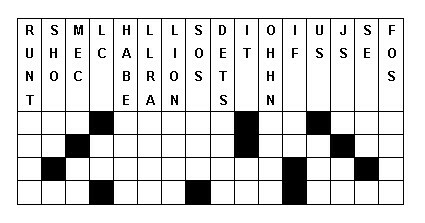 Each vertical column contains, not in order, the letters that go in the squares below them. - Place the letters in the appropiate boxes in order to form, on the horrizontal lines, a verse from the Bible. - The black squares are used to separate the words. - The words that reach the end of the line are continued on the next line. - All ponctuation marks are ignored. Print the page so you can blot out the letters you have already placed.